Disney's live-action remake of The Little Mermaid is reportedly courting former Disney Channel star Zendaya to play the lead role as Ariel. The studio has been making a killing with their live-action remakes of their beloved animated classics. Dumbo, Aladdin, Mulan, and The Lion King are all in various stages of production and it looks like The Little Mermaid will be next on that list. Mary Poppins Returns director Rob Marshall is reportedly set to direct from a script by Jane Goldman and production is expected to take place in Puerto Rico and Cape Town Africa. 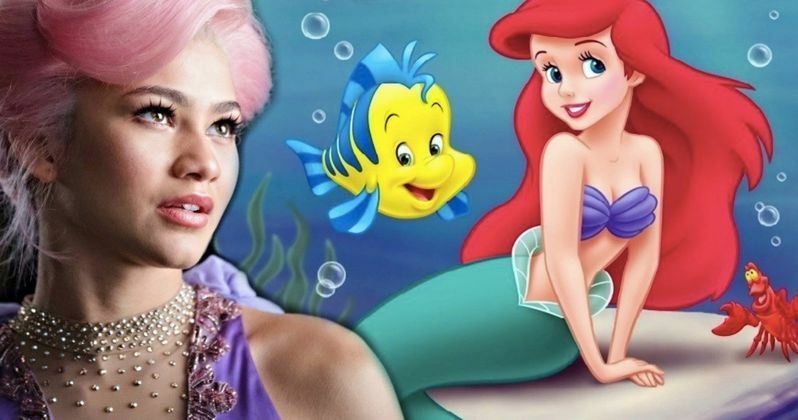 Disney and representatives for Zendaya Coleman have yet to respond to the reports about the actress taking on the role of Ariel in The Little Mermaid live-action remake, but the choice makes sense. Zendaya has a history with the studio and she has the singing voice needed to tackle the iconic songs from the animated classic. While Zendaya hasn't been confirmed for the remake, Hamilton's Lin-Manuel Miranda is officially co-writing the music for the film with composer Alan Menken. Not a whole lot about the project is clear, but Menken and Miranda will more than likely write new songs to compliment some of the original music from the 1990 animated film. Zendaya is currently in Europe filming Spider-Man: Far From Home and recently starred in The Greatest Showman alongside Hugh Jackman where she showcased her acting chops as well as her voice. She starred in two Disney Channel television series, Shake It Up and K.C. Undercover while launching her pop music career. The Little Mermaid live-action remake would easily be Zendaya's biggest role to date. Again, this has yet to be confirmed by Zendaya or Disney at this time, so we'll just have to wait and see what happens in regard to casting the remake. While casting Zendaya as Ariel in The Little Mermaid live-action remake seems like a no-brainer for Disney, it could end up creating controversy for hiring a woman of color to take on the role of Ariel. Public outcry for accuracy from source material and actors has been a hot button topic for the last handful of years. Scarlett Johansson was recently caught in her own controversy when it was announced that she was going to portray a transgender man in Rub & Tug. The actress ended up backing out of the project after LGBTQ activists began to criticize her for taking a role from a transgender actor. The casting of Zendaya in The Little Mermaid remake seems like a perfect idea, but there will more than likely be a backlash if and when an official announcement is made. For now, this is just a rumor, so hopefully the backlash doesn't start prematurely. For now, we'll just have to wait and see what Disney decides to do. The new report of Zendaya joining the cast of The Little Mermaid live-action remake as Ariel was first revealed by That Hashtag Show.